At first glance, it is sort of difficult to tell what Obtanix are about, but at closer inspection, the true nature of their offer is revealed, accompanied by a plethora of red flags popping up left and right, and too-good-to-be-true promises, some of which cross right into the realm of the ridicule. Obtanix is essentially a MLM (Multi Level Marketing) operation, based on the Ponzi model, which masquerades as a crypto-currency startup. The company promises to launch its own crypto currency called Xenos, every single unit of which is apparently backed by a gram of gold, stored in some “guaranteed” vault in Dubai, Switzerland or Hong Kong. While this gold-peg angle is brought up repeatedly during the various presentations on the pages of the Obtanix website, there is absolutely no solid proof delivered in this regard. We should believe the company has access to all this gold, simply because they say so. Leaving aside the fact that basing a mineable crypto currency on the gold standard would be hardly practical, the whole concept sounds truly ludicrous in Obtanix’s take. The operation was launched on February 2017, and considering how quickly ICOs move these days, it is something of a surprise that it still hasn’t launched its vaunted, gold-based Xenos yet. Then again, while the currently running pyramid scheme works as it is supposed to, there’s not much point in moving on to phase two of the swindle. What Exactly Does Obtanix Offer You? Obtanix has concocted a very intricate scheme, based on the continuous infusion of investment from newly hooked investors. The heart and soul of the operation is its 4-tiered membership package scheme, which currently promises 2.5-5% returns on investments, on a weekly basis. That would add up to 10-20% per month, which is indeed the definition of too-good-to-be-true. Apparently, these unrealistic returns result from the various investments the site makes on the cryptocurrency scene. This vague and generic explanation will have to suffice, because we are not offered anything else in this regard at the site. In addition to this ROI, Xenos units (worthless, despite the gold-based hype), and fast-track bonuses are awarded too. The fast-track bonus is the last piece of the pyramid scheme, which falls promptly into place. It is essentially a reward that participants get for referring other investors. The differential fast-track bonus is what holds the pyramid together over several referral-levels. The Basic membership package costs $100 and it comes with a single Xenos unit, plus a 5% fast-track bonus rate. The Starter package costs $500, offering the same ROI, but better fast-track bonuses and more Xenos. In fact, as the tiers go up, only the fast-track bonuses and the Xenos quantities increase, in yet another proof that we are indeed dealing with a pyramid scheme here. The Advance account costs $2,500 and the Premium one, $10,000. No. It has all the makings of a Ponzi scheme, and it would indeed be a major surprise if it turned out to be anything else. Even the way the site is constructed raises a number of red flags. Question marks and red flags abound through the Obtanix project, from the visual material used for the homepage, all the way to the lack of evidence concerning crypto mining, investing and the gold angle. We never find out much about the team/corporate entity behind the project either, and the name of the main “perpetrator” seems entirely made-up. 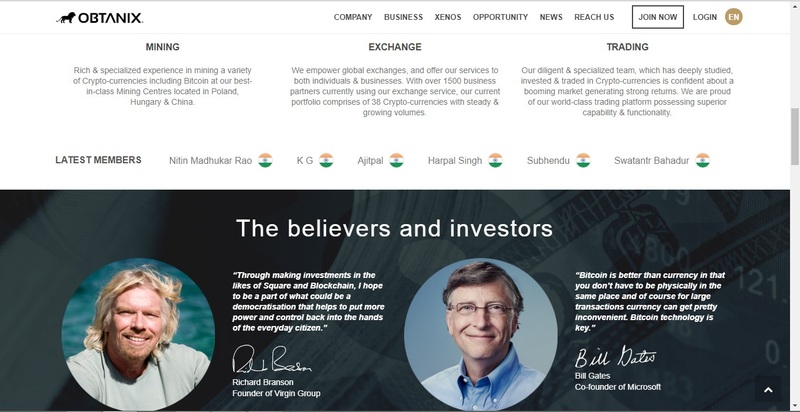 The way the homepage tries to make us think that Sir Richard Branson and Bill Gates are invested in the scheme, is frankly quite pathetic. Another red flag is raised by the ticker used to showcase the newly signed-up investors. According to it, only people from India register with the Ponzi scheme. Again: the only conceivable source of revenue the operation currently has, which can actually be backed up with proof, is the income stream resulting from investor contributions. This also explains why the sale of these membership packages seems to be the primary concern of the operation. The company allegedly behind the Obtanix project is Obtanix Holdings ApS, based at Lyngbyvej 13, 2100 Copenhagen, Denmark. The contact email is [email protected] There’s an email form available for contact purposes too. The Obtanix.com domain was registered in August, 2016, and the person who is listed as the owner is Obtanix Holding’s Darin Hadwin. As of November 21, 2017, the global rank of Obtanix.com, according to SimilarWeb, is 318,830, indicating the site is slightly popular. Almost 80% of its visitors reside in India. Other significant traffic sources include the United States, Kuwait and the United Arab Emirates. Obtanix is a rather obvious Ponzi scheme, which is looking to repeat the success of other similar schemes, such as Bitconnect. Its execution is way too sloppy though, so not many people are likely to fall for the pitch. Xenos is probably intended to be another pump and dump vehicle, but the way things are looking right now, it may never get there. Review Verdict: Obtanix is a SCAM! If you have been scammed by Obtanix, please let us know by commenting below. Learn about legitimate cryptocurrency investment routes by visiting our Bitcoin Investment Guide. To receive additional scam warnings and intuitive reviews from us directly to your inbox, please feel free to subscribe to ScamBitcoin.com! They have ceased payouts since for months now. They are fraud. DO NOT invest in it unless you want to give away your money. please don’t invest in obtanix compny this is totally fraud …not giving withdrawal from last two month ….xenos and zion all r fraud.. I know a lot of people who have invested in Obtanix and they are planning to sue those people who are responsible for luring them into investing in this scheme.The agent of Obtanix had taken the money in his account and after a few returns that they got which was a few thousand rupees everything has come to a naught. It’s been many months since the announcement from RBI whereby people cannot use bank transactions to invest in Obtanix that the investors have not got any returns.I know a personal friend and many others who has invested in this scheme and I guess the only way out for them is to file an FIR with the Economics Offence Wing. So please don’t invest.